On March 10th I launched my second Tweetinar, “Social Media – The BIG Picture” based on Part Three of my book. This “Tweetinar” delivered social media insights three times a day, five days a week at 10:00 AM, 12:00 PM, and 2:00 PM, Monday through Friday, and runs all the way through SEPTEMBER!If you missed any of my first Tweetinar I will share those social media insights with you in each of two, bloginars. The Third 60+ social media insights are below. Be sure to RSS this blog or check back soon for the final 60 tweets to complete your Five Steps To Social Media Success bloginar. Also remember to follow my tweets for more social media insights and the biggest Tweetinar yet! • Blogging is one of the most powerful ways to increase your SEO. • According to the 2004 CAN SPAM Act, the definition of SPAM is unsolicited commercial message. • Commercial messages CAN be sent if they are transactional or relationship messages. • SPAM isn’t: Messages sent to complete a transaction, warranty, product updates, upgrades or recall information. • SPAM isn’t: Change in terms of subscription or service, account balance information. • Your customers & prospects want updates, helpful, useful, content and conversation. • Your customers & prospects want interactive or “rich” media; text, photos, and especially video. • Your strategy HAS to include: good content, reasonable frequency, and proper communication tools. • Your strategy HAS to include a conversion strategy as well. • What do you want your customer / prospect to do when done? • If you don’t know what your conversion strategy is… Your customer / prospect doesn’t either. • Understand the Five ‘W’s of micro-blogging; Twitter, Google Buss, Yammer, or the platform you use. • Part 2 of the Trinity is micro-blogging, SMS texting. • Understand Twitter, Tumblr, TwitPic, Tweets, hash tags, Direct, ReTweets, Following, Followers. • Understand Bit.ly and Tr.im URL shortners, and HootSuite Twitter scheduler. 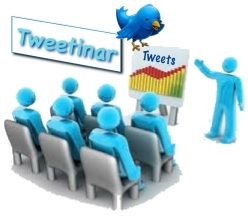 • Understand Seesmic Desktop and TweetDeck, and other Twitter tools. ANd… TWEET! • Understand the psychology behind the technology. Why does Twitter work? • Twitter is limited to 140 characters. It’s this limitation that make Twitter so effective! • Mark Twain (Samuel Clemens): I apologize for the length of the correspondence, given more time it would have been shorter. • Given more time, Mark Twain’s correspondence would have been more succinct. More to the point. • Twitter forces us to get to the point. You can’t ramble when limited to 140 characters. • Content Still Is King. Long Live The King! • The blogs that are getting followed and the Tweets getting read are the ones with the best content. • By staying in front of your customers / prospects several times a day with useful content, you WIN! • All of your content ALWAYS has to have a strong “what’s in it for me” residual. • All of your content has to have a strong “I didn’t know that” residual. • Make your content useless, what your having for lunch, your plane is 10 minutes late, you will be UNFOLLOWED. • Even though your content is free, your customers / prospects are still spending something. TIME. • Your content has to be of equal worth to the time they spent comprehending it. • Often time, is more expensive than money. • Understand Cyber-Surveillance. Follow your brand, follow your company, follow your name. • Understand Seesmic Desktop and TweetDeck to follow the conversations about you. • People ARE talking about you behind your back. It’s not the schizophrenia, your meds are working. • Get engaged in the conversation, whether it’s blogs, twitter, Facebook, or any social technology. • By “searching” your name, company, product, you get every Tweet at the same time as the recipient. • Be sure to set up Google alerts and SocialMention to be aware of the conversations taking place. • Cyber conversations WILL take place with & without your knowledge and your permission. • Engage in those conversations. Your customers / prospects are insisting you do. • Never sell. When prospects are ready to buy, they will remember you and buy. • Always giving useful content, when it’s time to buy, your prospects will have a “psychological indebtedness”. • “Psychological indebtedness” is like on Christmas when someone gives you an unexpected gift. • For the next 6 months you try to make it up to them. Your prospects feel the same way. • Part 3 of the Trinity is social networks. • Identify the best social networks for each of your micro-demographics. • Maybe it’s Facebook with 6000 million members. • If Facebook were it’s own country, it would be the 4th largest country in the world! • Don’t rule out MySpace with 200 million members and include LinkedIn at 90 million. • From a marketing perspective a place that like-minded people gather is a “watering hole”. • The same demographic read a particular newspaper or listen to a particular radio station. • Facebook is a water holes 600 million strong. 600 million like minded people in a broad sense. • Facebook members number nearly double the entire U.S. population, every man, woman, & child. • You have to provide the environment where your customers / prospects can engage in their conversation. • Like before, determine your strategy, the culture of the network, your person, & conversion. • Remember, you’re developing a relationship first. There’s a reason they call it “social” media. • Step 3 in this 5 part social media success series is “Integration”. • Now that you’ve completed Step 1 and know every marketing campaign in detail, integrate. • Ways to integrate is using an automated email signature with all of your social networks.